I had not heard this commencement speech, though it is available to view online. I was just interested in anything Gaiman-related. The book arrived in the mail and I opened it to look over only, yet found myself sucked in, reading it through rapidly. 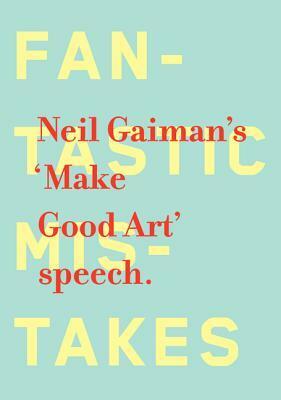 The content of Gaiman’s “Make Good Art” speech is a healthy mix of personal stories/insight with familiar advice (à la ‘do what you enjoy’), and is buffered throughout with Gaiman’s typical brilliant humor. The text of the speech is laid out by graphic designer Chip Kidd. At times the layout breaks up the flow of Gaiman’s thoughts in an odd fashion, or arranges the words in a way that takes a moment or two to decipher, much as in a poem. This translates Gaiman’s speech into Kidd’s interpretation of Gaiman’s speech, which then is further interpreted by how the reader processes the text. On the whole I found this a positive trait, contrary to some other reviews I’ve seen. Kidd’s design produces an interesting and engaging complement to listening to the speech, and allows new discoveries to be made in the message as one goes through it in this new form, even after multiple times. (Which is an important consideration if buying this slim volume) Adding to its value, the book is physically quite sturdy and well-constructed. I assume this is intended to be a nice ‘gift book’ for people to give to recent graduates. One wonders whether if after a reading or two the book might just sit and gather dust on a shelf. For many it may, but personally I think it is a message one would do well to revisit again through the years. These words are not just for the graduate, but long-before and long-after such an event as well. As someone who isn’t an artist, but rather a scientist, I found it noteworthy that the message is just as appropriate for people in other fields and passions.